"Jesu" redirects here. For other uses, see Jesu (disambiguation). This painting shows Jesus in the center at the Last Supper. It was painted by Leonardo da Vinci between 1495 and 1498. Most historians agree that he was a Jew from a place called Judea, in a town called Nazareth, in what is now Israel. They also agree that he was thought of as a teacher and a healer, and that he was baptized by John the Baptist. He was crucified in Jerusalem on the orders of Pontius Pilate, and rose again on the third day. Jesus taught mostly love and forgiveness for others, as well as being humble about one's religion. He talked many times about the kingdom of God, and told others, "The kingdom of God has come near." He said that one must be mild, like a child, and never boast. He taught that people who ignore God and other people do not deserve his blessing, but God would still forgive them if they repented. Jesus opposed the other Jewish priests because they used religion to boast. This led to other Jewish leaders hating Jesus, because Jesus was trying to stop them. Jesus also opposed human authority,[source?] leading to a trial and conviction to death by the Jewish leaders and then to his execution on a cross by Roman authorities. There are stories about the life of Jesus by different writers. The best known are the four Christian books called the Gospels. They form the beginning of the New Testament, a part of the Bible. The word "gospel" means "good news". They tell a little about his birth and hidden early life, but mostly about his public life: his teachings, miracles, ministry, death, and resurrection (return from death). Several Jewish and Roman historians, such as Flavius Josephus, Tacitus,[note 1] Pliny the Younger, and Suetonius include Jesus in their writings. They usually only tell of his execution or problems between the Roman government and his followers; they do not talk about his life, since his life was not a problem they had with Jesus. Manichaeans, Gnostics, Muslims, Bahá'ís, and others have found prominent places for Jesus in their religions. The Quran claims that Jesus was a Muslim. Bahá'í teachings consider Jesus to be a "manifestation of God", a Bahá'í concept for prophets. And also some Hindus consider Jesus to be an avatar or a sadhu. Some Buddhists, including Tenzin Gyatso, the 14th Dalai Lama, regard Jesus as a bodhisattva who dedicated his life to the welfare of people. The name Jesus came from the Aramaic name "Yeshua", from Hebrew Yah-shua, meaning "God is salvation (or deliverance)" in English, and was a popular name of the time. Jesus is often called "Jesus Christ" or "Christ". The word Christ comes from the Greek word christos and means "the one marked on the head with oil" or "the anointed one". In Jesus' country, anointing was done to show that a person was chosen to be a king or a leader. Jesus is also called Messiah, which comes from the Hebrew term Mashiakh, and also means "the anointed one". Some people, like the disciple Thomas, said, "I'm not going to believe this, until I have seen it with my own eyes!" But the Bible says that more than 500 people, including Thomas, saw Jesus alive again. There are many stories in the Gospels about what Jesus did after he was resurrected. Finally, the Gospel of Luke says that Jesus took his disciples to a hill, where he blessed them and told them to spread his teaching through all the world, and that then clouds came down, and he was lifted up to Heaven. This mosaic from 1100, Athens, shows Jesus as Judge of the Earth. Many Christians believe that these verses say Jesus is God. All Christians believe that Jesus' death on the cross allows all people to be forgiven by God for their sins (bad things they have done). Most Christians believe that if a person asks God to forgive them He will do so, and they will get to live forever with him in Heaven. 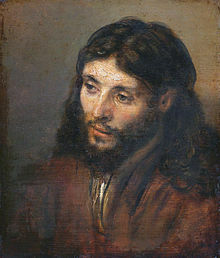 Jesus painted by Rembrandt, Dutch, 1600s. Rembrandt used a Jewish man as his model. Many Christians believe that, by the teaching of the Bible, Jesus was not only truly God but also truly human and that this was part of God's plan to bring humans closer to understanding him. People who do not have Christian beliefs, have different ideas about Jesus. In Matthew's Gospel, 24:30 Jesus says "Then will appear in heaven the sign of the Son of Man, and then all the tribes of the earth will mourn, and they will see the Son of Man coming on the clouds of heaven with power and great glory." Like King David, in Psalm 8, Jesus is making a difference between his ordinary human life and his great power as the Son of God. "For God so loved the world, that he gave his only Son, that whoever believes in him should not perish but have eternal life." John's Gospel, 3:16. Jesus said to him, “I am the way, and the truth, and the life. No one comes to the Father except through me." John's Gospel, 14:6. Some people who are not Christians believe that Jesus lived at the time that the Gospels say, but do not believe that Jesus was the "Son of God" or "Savior". They believe that Jesus was an ordinary, but very good person, a teacher and perhaps a prophet. Islam teaches that Jesus did not die on the cross, but another man disguised as him went on the cross for Isa (Qur'an 4:157). This is very different from Christianity. Jesus' death is a very important part of the Christian belief about salvation. Muslims always say "peace be upon him" after saying Jesus' name as a sign of respect in short and Arabic a.s. The Qur'an (like the Bible), mentions the virgin birth of Jesus but then it says other things about Mary (Islamic-Maryam). The Bible says that Joseph helped Mary give birth to Jesus, but in Islam there is no Joseph. Instead, Mary walked the desert alone in labor and found a tree. The angel Gabriel (Jibreel) asked if she was hungry, then told her to shake the tree and dates fell for her to eat. Then he asked if she was thirsty and he said look down at your feet and there was water and there she gave birth to Jesus. (Qur'an 19) This is why Muslims fast and how they break their fast. Mary knew she had to go back to her town and when she did, with Jesus in her arms, the people were shouting at her for adultery. Mary wanted to explain herself but the Angel told her not to speak. Nearly all modern scholars, both Christian and non-Christian agree that Jesus was a real person. Both Christian and non-Christian scholars base their studies of him on the Gospels. They are believed to have been written between 60-90 AD. By tradition, the Gospels were written by four men, Matthew, Mark, Luke and John who gave their names to these books. This is the order in which they are arranged in the New Testament of the Bible, but scholars think that it is not the order in which they were written. The Gospel of Mark was probably written before the Gospel of Matthew. The four Gospels all tell the story of the Life of Jesus, but they do it from four different points of view, because they were written by different people and each writer had reasons to tell it in a different way. 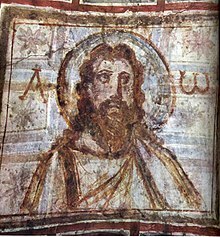 Dating from 4th century Rome, this is the oldest known picture of Jesus showing him as a bearded semitic man, rather than a shaved, short-haired Roman. Jesus as a child, with his mother, Mary. This picture is called "Theotokos of Kazan". The apostle Luke was Greek and a friend of the apostle Paul. He was a doctor. Luke came to know about Jesus from the disciples. Luke writes about the birth and the childhood of Jesus and he says "Mary kept all these things in her heart and thought about them." Luke was not a Jew and he writes in a way that is easy for other people who are not Jews to understand. He explains Jewish customs and laws. He wrote a second book called the Acts of the Apostles which tells what the disciples did after Jesus had left them. A church window with the story of The Good Samaritan. In this story from chapter 15 of Luke's Gospel, Jesus tells how a rich man had two sons. They would both get a share of his money, when he died. The younger son said, "Father, give me my money now, so I can go and enjoy myself, while I'm young." He took the money to the city, and spent it all on parties with his friends and other sinful things. Soon he had none left to feed himself and was ashamed. He got a job caring for pigs, a unholy meat to eat, just keep himself from starving. He said to himself, "I'll go home to my father and I will say, 'Father, I have sinned! Please let me be a servant in your house!'" When his father saw him coming, he ran along the road to put his arms around his son. The father said, "Bring the finest clothes! Kill the fattest calf to make a feast!" When the elder brother heard all this, he was angry and said, "I'm a good son to you, but you never even gave me one little goat to have a party with my friends!" The father said, "You have always been with me. I love you greatly, and all I have is yours, but my son who was lost is now found! My son who seemed to be dead is alive! Be happy with me!" Jesus said that this is the way God loves and forgives his people, when they ask for forgiveness. ↑ Meier writes that Jesus' birth year is c. 7 or 6 BC.Rahner states that the consensus among scholars is c. 4 BC.Sanders also favors c. 4 BC and refers to the general consensus.Finegan uses the study of early Christian traditions to support c. 3 or 2 BC. ↑ Most scholars estimate AD 30 or 33 as the year of Jesus' crucifixion. ↑ James Dunn writes that the baptism and crucifixion of Jesus "command almost universal assent" and "rank so high on the 'almost impossible to doubt or deny' scale of historical facts" that they are often the starting points for the study of the historical Jesus.Bart Ehrman states that the crucifixion of Jesus on the orders of Pontius Pilate is the most certain element about him.John Dominic Crossan and Richard G. Watts state that the crucifixion of Jesus is as certain as any historical fact can be.Paul R. Eddy and Gregory A. Boyd say that non-Christian confirmation of the crucifixion of Jesus is now "firmly established". ↑ Tacitus tells about the death of Jesus in his Annales: Perseus-Project: Annales 15,44 In the passage, Tacitus talks about the burning of Rome, which Nero attributed to the Christians (or Chrestians): Christus, from whom the name had its origin, suffered the extreme penalty during the reign of Tiberius at the hands of one of our procurators, Pontius Pilatus, and a most mischievous superstition, thus checked for the moment, again broke out not only in Judaea, the first source of the evil, but even in Rome, where all things hideous and shameful from every part of the world find their centre and become popular. ↑ Easter is not held on the same date every year, because Jesus' death is always remembered on a Friday called "Good Friday". Easter is celebrated the first Sunday following the first full moon after the Spring Equinox. This means it can be celebrated in March or April. Western churches, like the Roman Catholic Church, use the Gregorian calendar and Eastern churches, like the Eastern Orthodox Church, use the Julian calendar. Because of this, the date of Easter celebrations is different for these two types of churches even though the way they calculate the date is the same. ↑ This is one of many songs or "psalms" are believed to have been written by David, a shepherd boy who became the King of Israel and was a great musician. Matthew's Gospel shows that Jesus' father was the direct descendant of King David. ↑ Humphreys, Colin J.; Waddington, W. G. (1992). "The Jewish Calendar, a Lunar Eclipse and the Date of Christ's Crucifixion". Tyndale Bulletin 43 (2): 340. http://www.tyndalehouse.com/tynbul/library/TynBull_1992_43_2_06_Humphreys_DateChristsCrucifixion.pdf#page=9. ↑ "World's top ten most significant people EVER (according to Wikipedia)". Mail Online. 10 December 2013. ↑ "Top Ten Lists at TheTopTens.com". www.thetoptens.com. ↑ "Jesus Christ — the most famous Person in history - Voice in the Wilderness Ministries". ↑ Brown, Raymond E. (1994). The death of the Messiah : from Gethsemane to the grave : a commentary on the Passion narratives in the four Gospels. The Death of the Messiah: From Gethsemane to the grave: a commentary on the Passion narratives in the four Gospels. New York: Doubleday, Anchor Bible Reference Library: Doubleday. p. 964. ISBN 978-0-385-19397-9. ↑ Cohen (1987). pp. 78, 93, 105, 108. ↑ Grant, Michael. pp. 34–35, 78, 166, 200. ↑ Meier, John P. (1993). 1:68, 146, 199, 278, 386, 2:726. Sanders. pp. 12–13. ↑ "Bible Gateway passage: Mark 1:15 - New International Version". Bible Gateway. Retrieved 2018-10-01. ↑ Sanders 1993, p. 12. ↑ Levine 2006, p. 4. ↑ Watson, Francis (2001). "The quest for the real Jesus". In Bockmuehl, Markus N. A. (ed.). Cambridge companion to Jesus. Cambridge University Press. pp. 156–57. ISBN 978-0-521-79678-1. ↑ Evans, C. Stephen (1996). The historical Christ and the Jesus of faith. Oxford University Press. p. v. ISBN 978-0-19-152042-6. ↑ Delbert, Burkett (2010). The Blackwell Companion to Jesus. John Wiley & Sons. p. 1. ISBN 978-1-4443-5175-0. ↑ Stockman, Robert (1992). "Jesus Christ in the Bahá'í Writings". Bahá'í Studies Review 2 (1). http://bahai-library.com/stockman_jesus_bahai_writings. ↑ Rishi Das, Shaunaka (March 24, 2009). "Jesus in Hinduism". BBC. ↑ Beverley, James A. (June 11, 2011). "Hollywood's Idol". Christianity Today. ↑ GCSE Religious Studies: Complete Revision and Practice. Coordination Group Publications. 2009. p. 105. ISBN 9781847624062. ↑ 33.0 33.1 33.2 "SALVATION: WHAT DID THE GOSPEL WRITERS AND PAUL SAY?". www.religioustolerance.org. ↑ "Comparison Chart: Religious Views of Jesus". religionfacts.com. 2014. Retrieved 12 July 2014. ↑ Fitzgerald, Michael (2014). "Christ and the other religions". Commission for Interreligious Dialogue. Retrieved 12 July 2014. ↑ Mark D. Roberts, Are the New Testament Gospels Reliable? ↑ Augustine, De Adulterinis Conjugiis 2:6–7, Cited in Wieland Willker, A Textual Commentary on the Greek Gospels, Vol. 4b, p. 10. Robinson, John A. T. Redating the New Testament. Eugene, OR: Wipf & Stock, 2001 (original 1977). ISBN 1-57910-527-0. Levine, Amy-Jill (2006). "Introduction". In Levine, Amy-Jill; Allison, Dale C.; Crossan, John D. (eds.). The Historical Jesus in Context. Princeton Univ Press. ISBN 978-0-691-00992-6. Theissen, Gerd; Merz, Annette (1998). The historical Jesus : a comprehensive guide. Minneapolis: Fortress Press. ISBN 0800631226. "CATHOLIC ENCYCLOPEDIA: Jesus Christ". newadvent.org. Retrieved 13 April 2010. "Jesus Christ homepage". rejesus.co.uk. Retrieved 13 April 2010. "Life of Jesus Christ". easyenglish.info. Retrieved 13 April 2010. This page was last changed on 23 April 2019, at 14:34.